For me, stand up paddling provides the mind-clearing benefits of my hot yoga class without having to contort my rather inflexible self into uncomfortable positions in unbearable heat and also the stress-busting effects that my money-sucking downtown bootcamp does…all in the great outdoors. As a personal (and unscientific) advocate for the benefits of stand-up paddling, I was pleased to hear that my self-centric views of the sport’s health benefits are supported by research – and really important research. I recently learned about a remarkable new program called PaddleOn established by the Pinc and Steel Rehabilitation Trust and supported by New Zealand’s Breast Cancer Foundation. In 2015, a pilot of the program was launched to study the effects of stand up paddling over an 8-week period for 62 women battling breast cancer. The results were incredible – with improvements in weight loss, balance and strength as well as psychological improvements in mood, memory and energy levels. The research also noted an increase in confidence levels for the participants as well as an opportunity to be on the water with a group of women facing similar personal challenges. 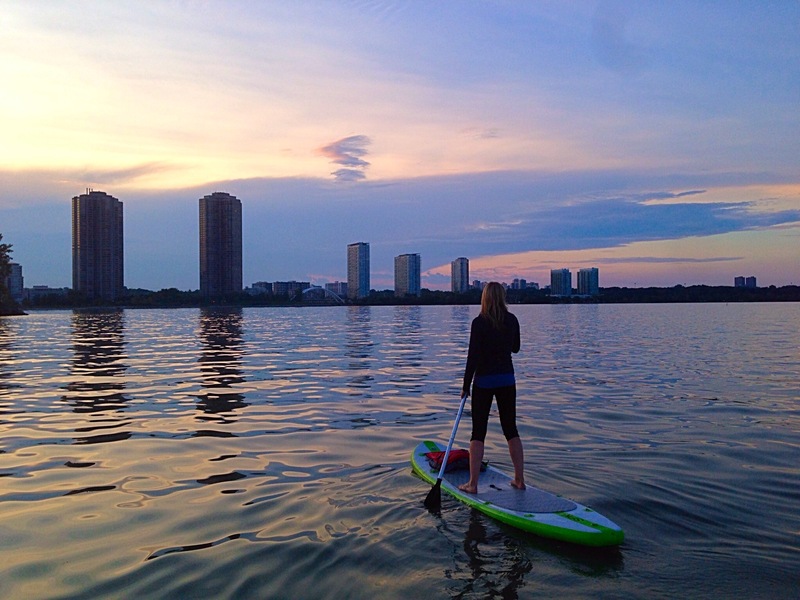 Looking for great places to stand up paddleboard in Toronto? Look no further. I’ve discovered some of the best places to stand up paddle in the Toronto area from the City’s West end to the East end. Each place is a little different and they’re all located nearby. Humber Bay is one of my favorite places to SUP. Located in Etobicoke, it’s a little further from downtown Toronto but the fantastic views of the CN Tower and city skyline make the trip absolutely worth it. Humber Bay consists of two parks – Humber Bay East and Humber Bay West separated by Mimico Creek. I prefer Humber Bay West as there is usually plenty of parking (pay parking) and many places to drop your board in. The water in Humber Bay always crystal clear – so clear that you’ll often come across scuba divers while you’re out paddling. 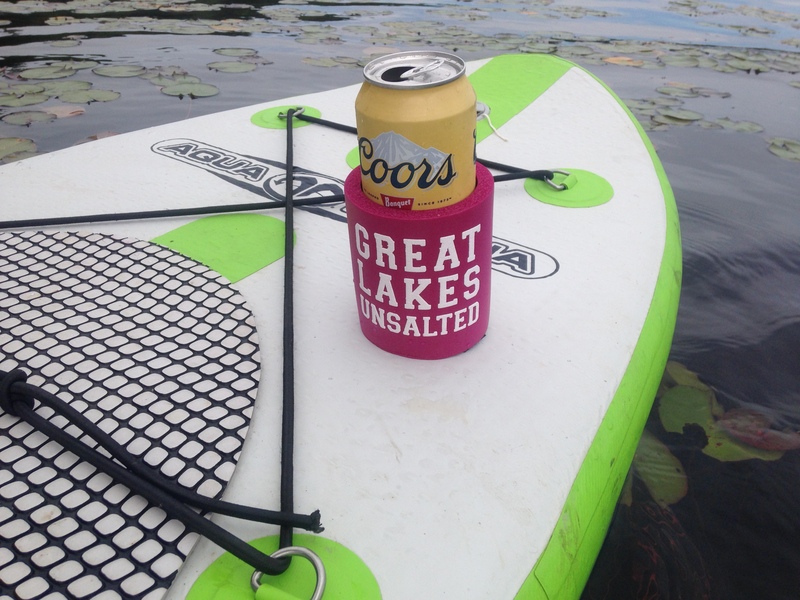 Inflatable stand up paddleboards (SUPs) are becoming increasingly popular. And for good reason – they are significantly lighter than hard boards and are easily transportable and storable. As a condo-dweller with very limited storage space, I am a huge fan of inflatable SUPs. I got my inflatable board about two years ago and it’s been one of the best purchases I have ever made. It fits in a large duffel bag and I can throw it into the trunk of my car and take it absolutely anywhere. 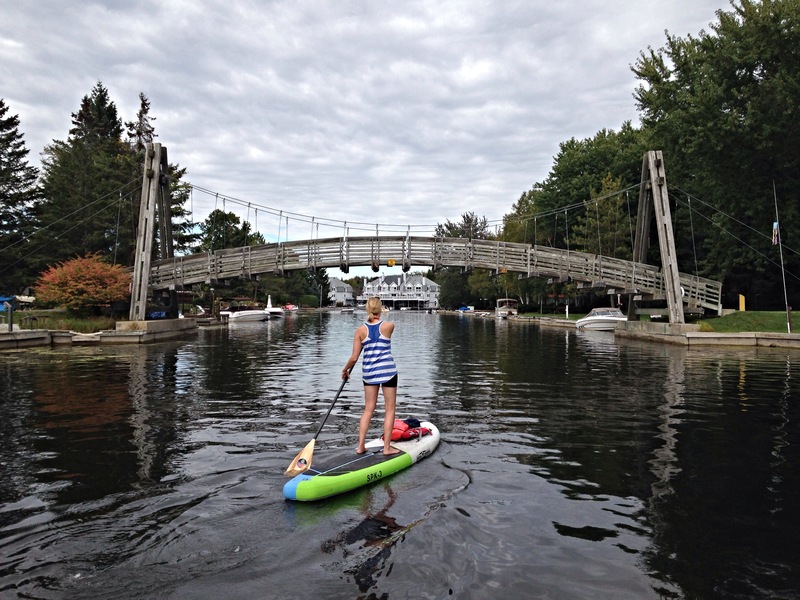 I’ve explored many places in Ontario on my inflatable SUP – from flat water canals and ponds to 20+ kilometer river paddles (with rapids) on the Saugeen River. Here’s a fast motion video of me rolling up my board from this past weekend. Compact, right?! Lagoon City, Ontario is a boater’s paradise on Lake Simcoe comprised of – you guessed it – a series of lagoons. But chances are, you haven’t heard of it. This place keeps a low profile and probably for good reason – the people who live here want to keep it their little secret. Lagoon City is an urban planning marvel and the 1960s brainchild of Hungarian engineer Andrew Zsolt. It’s a canal-side community with a mix of single-family homes and condos complete with a marina, sailing club and easy access to Lake Simcoe. I would describe it as a modern Venice, Italy or an alligator-less Fort Lauderdale. My friend and fellow paddler, Alison, and I had seen a few pictures of this mysterious place and couldn’t let another summer go by without checking it out by paddle board. In late September this year, we made the hour and a half trek from Toronto to Lagoon City.